Thyroid disease is considered a comorbid condition for headaches and migraines. This means that although it occurs independently of the headaches it still can intensify them and can also make treatment much more complex. A comorbid condition may have an enormous effect on the provision and success of medical treatment. Thyroid diseases, including hypothyroidism and hyperthyroidism, are among the conditions now known to often coexist with headaches and migraines. A great deal of research focus in headaches involves the connection between headaches and female hormones when, in fact, endocrine hormones are also extremely important in headache aetiology. Genuine migraine headaches are not directly caused by thyroid disease. The abnormal high and low levels of thyroid hormones that are characteristic of thyroid disease can, however, intensify migraines. Any disease of the thyroid gland can impact virtually every organ in the body so it is not surprising that headaches are often intensified when a person also suffers from thyroid disease. Thyroid disease is also much more likely to occur in women than men and when you take into account the effect of female hormones on headaches, women can be hit particularly hard with intense headache pain. The effects of thyroid disease on menstruation itself further compound the problem and can alter headache and migraine patterns. If you suspect that your headaches may be related to thyroid disease, you should see your doctor. He or she will likely have blood tests performed to determine endocrine hormone levels and to rule out any other disease states that may be causing or affecting your headaches. For hypothyroidism, treatment usually involves a daily dose of synthetic thyroid hormone. 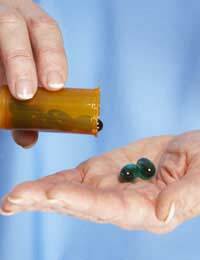 For hyperthyroidism, there are a couple of anti-thyroid drugs available that your doctor will likely prescribe for you. Treatment depends on the level of the disease as well as other factors such as your age. If your periods have been irregular due to thyroid disease, correcting your hormones will likely help get your menstrual cycle regulated and this may also help to improve your headaches. Beta-blockers may be prescribed in addition to a primary thyroid drug, and these are also effective in treating headaches. For immediate relief, you can usually safely take over-the-counter drugs such as acetaminophen and ibuprofen but do check with your doctor first. Although alternative therapies that are focused on relaxation may be helpful, if it is determined that you have thyroid disease, you will most likely have to take medication. Any treatments for stress can still provide benefits but can't replace synthetic hormone thyroid medication. Fortunately there have been enough advances in thyroid treatment that you can generally expect to get your symptoms under control, including your headaches. I am suffering from hpohoiridism. I have enhanced levels of serum cholesterol. Butmy irritating problem is my migraine headache.I am suffering from this migraine for the last 50 years . My age is 73 at present. There is a view that the migraines go off with advanced age. But in my casethe frequency of attacks has increased. Earlier it used to be once a week or once a fortnight . But now I almost have it daily . I am onthyronorm. Earlier I used to take 75 mg, but TSH came down to almost zero level. So I adjusted the dosage to 25 mg. It again shot up to 11 and I adjusted the dosage to 62 mg. I continue to have the acute migraine daily. Of course triggersalso hasten the attack. I have been taking 5mg Rizatriptan almost daily to get relieved, Please advise what to do. Is it safe to take 5mg Rizotriptan daily. Is there any relation between my head aches ad hypothoiridism. Sir I have thyroid from last year but now a day,s I have lots of headache. @Deb - I'm sorry to hear about your problems. I'm afraid we can't give any direct advice except, but age shouldn't be an issue and if it is making your life a misery you need to push this further with your GP by requesting further consultations in order to find a diagnosis. First off I am almost 60 postmenopausal and experiencing terrible headaches that some days I cannot control. Since October I have had 2 MRI's a CT Scan a full vision test, bloodwork and a 3D Dental. I have no answers. I have complained to my Dr. for years that I have no energy and am just not the me I was 10 years ago. I understand and allow for aging this isn't aging and it's progressively getting worse. The Dr. says my blood work is great and would be for someone even 10 years younger. Any suggestions all are appreciated this is ruining my life. I took an herb called bugleweed for my hyperthyroidism. It depresses high TSH and T3, T4 levels. My doc said if I had had Graves it would haved cured mine. Unfortunately, I have undetectable TSH levels so it was not a perfect fit for me. My doctor had me take blood tests while on it to monitor the levels. This herb works. Also lemon balmis good. Talk w/ your doc and do your research. Bugleweed is used in Germany and approved by their medical commission. I have been having headaches everyday sometimes ALL day and my Endo. doctor has me taking a higher dose of thyroid medication than my blood test shows I need. Because I had a thyroidectomy for cancer, he thinks having more thyroid medication than is needed will keep a reoccurrence of cancer from happening. I am suffering terribly with these headaches. I would rather take the chance of cancer reoccurring that suffer like this. Life is very unpleasant for me. My question is, do you think about this and should I get a second opinion? I have been dianosed with Graves Disease. I have hypertyroidism. I am deathly allergic to iodine. I stay on a high dosage of P... to control it. My eyes don't bug out anymore, lovely, I have to monitor my kidney function but its a lot better than the Thyroid Storm that almost took my life. I anyone out there that can tell me what to take for my occasional Migraines? I'm having one right now. At the age of 28 I started having these horrible headaches at nite.They would wake me about an hour after I went to bed.I seemed to get them in the spring and fall.For years my doctor treated me for migraines and sinus infections only to have them continue to increase in frequency and severity over the next 15 years.Also around the same time (age 28) I started to have very heavy periods and high chloesteral ( was was 5' 3" and 118 lbs then).No amt of diet and exercise would bring my chloestral down to normal.After suffering for many, many years....I actually diagnosed my self with cluster headaches.At first Topamax and oxygen helped.But when I started having alot of other thyroid(hypothroid) issues I asked my doctor about my thyroid.She said it was fine.After more years of suffering...I insisted on seeing an endocronoligist about my thyroid.Surprise, surprise....I was hypothyroid.She put me on Armor Thyroid and not only did my thyroid issues improve but it has been 3 years and I have not had a cluster headache!I almost took my own life because of these headaches!I had an unnecessary hysterectomy!I couldn't work, sleep, and the pain was undescrible!If you are suffering with cluster headaches...it is worth having your thyroid checked out.You maybe suffering for no reason.